Muscling the Bergey's tail into position. row? Well Randy knows what temperature the ducks like the water, and you can rest assured that the pond will be just that. He is an asset to the industry! Rose Woofenden, and her dad Ian, came over from western Washington to help. Rose was born in a wind and solar-electric powered house, and Ian works for Home Power and coordinates workshops for Solar Energy International (SEI). Kelly Keilwitz of Whidbey Sun & Wind, also a Bergey dealer, traveled over the mountains with the Woofendens to help. Bill Hoffer, an energy efficiency and renewable energy consultant who often collaborates with Brooks Solar was on hand as well. Randy Brooks and the owners were willing to allow the installation to be a demonstration project. Northwest Sustainable Energy for Economic Development (NW SEED) invited a group of individuals to monitor the installation. The group included a solar equipment distributor in Oregon interested in getting into the wind industry, a business development director for a general contractor from central Washington, and an SEI graduate and Bergey certified dealer from Spokane, among others. All fees the NW SEED participants paid were used to offset the cost of the installation. In return, June had an endless flow of coffee, snacks, and sandwiches for all. Mounting the blades using an impact wrench. Overcurrent protection at the tower's base. the first cut of a Bergey installation video, and mentioned updates both to it and the installation manual. On Tuesday morning, we woke to the loud squawking of guinea hens. We headed up the wildflower littered hill to the turbine location. It was a gusty day on the ridge, which was both encouraging and a bit worrisome. No one wanted to work in high winds the next day when the crane would show up. tail 70 degrees, taking the turbine out of the wind. The tail has a shock absorbing system that prevents the tail from snapping back into position after releasing the winch, to prevent unnecessary wear and tear on the machine. Down in the shed, Lance was wiring the inverter and replacing the #8 (8 mm2) ground wire from the service disconnect to ground rods with #6 (13 mm2) to comply with code. 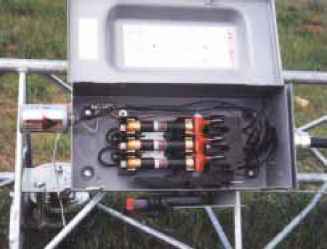 Lance also used wire pulling lubricant to snake the #2 (33 mm2) wires from the system disconnect to the inverter. This stuff is messy, but easy to clean up and worth its weight in gold. A lot of sweat and many a smashed knuckle has been saved by this goop. By the end of the day, the tower was ready and everything was in place for the crane to come in— everything except the tail, that is. Charlie's granddaughter was painting his cattle brand on it. Fortunately, the sun was shining and the winds had died down for the tower raising. Lance finished all the wiring for the inverter and second disconnect, located down by the shed. Duncan Crane Service out of Moses Lake showed up right on time, and everything was ready. The crane was positioned between two anchors on the uphill, prevailing wind side of the tower. we had to wiggle the sections and use drift pins to get all the holes to line up to connect the sections. 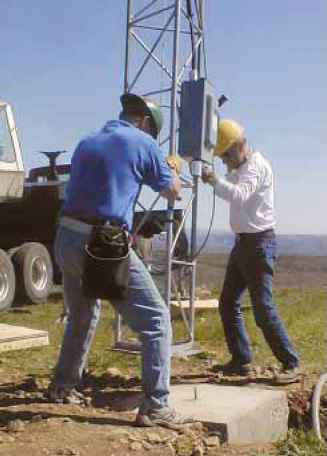 After assembling the tower and torquing the bolts to 150 foot-pounds each, we ran the transmission wires through the tower, and tied them to a tower leg with zip ties. As the wires were run through the tower, the equalizer plates were being attached to the anchor rods. The equalizer plates help evenly distribute the load from the guy wires to the anchor rods. Then the guy wires were laid out from the tower, a pair running to each anchor rod set at 50 feet and 90 feet (15 and 27 m) on the tower. Bill Hoffer brought an inverter and Randy brought some batteries, charged from his Bergey XL.1 wind machine at home, to provide remote power for electric tools on site. This came in handy when a little on-site engineering was needed to help hold the tower off the ground. Randy used his Sawzall to turn the 4 by 4 framed turbine-shipping pallet into a brace for the tower. This freed up the crane to lift the 1,060 pound (481 kg) turbine head, so we could bolt it to the tower. The crew lined up all the holes, making sure that the furling cable and electrical wires were all aligned properly. Once the turbine was attached, Randy used a RotoFlex to strip the metal casing around the wire housing, setting the depth so that it didn't cut the wires. All the final wiring was completed, the furling cable was attached, and we caulked around the electrical box on the turbine head. After all the bolts were properly torqued, it was time to put the branded tail on. This was a snug fit to say the least. 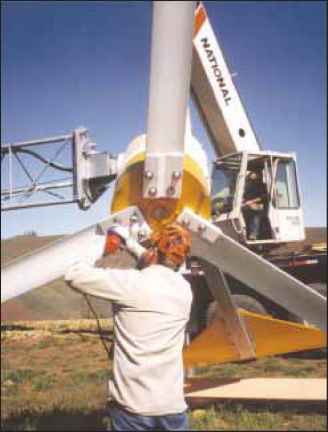 The 145 pound (66 kg) tail was supported by the crane, and with some extra elbow grease, the pivot pin was inserted into its hole on the turbine. Then it was time to attach the blades. Anti-seize compound was used on the bolts to prevent rusting and seizing, and CRC SP-400 severe environment corrosion inhibitor was sprayed on the alternator to keep the blades from sticking to it. After using an impact wrench to torque down the blade bolts, we were ready to raise the tower. Putting the base in place. 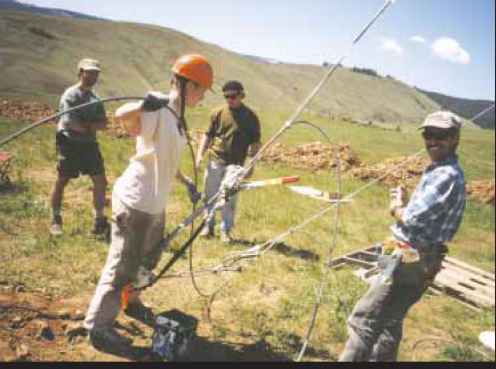 Senior energy services engineer Dr. Jim White of Chelan County PUD instituted the SNAP program in 2001. Local utility customers pay a voluntary amount, from US$2.50 to US$50 per month, to support locally generated, grid-connected, clean electricity. The program is designed for small producers only, with a maximum rated generation capacity of 25 kilowatts each. Producers are paid a percentage of the pool based on their percentage of the total renewable KWH generated. All the money donated for the SNAP program goes directly to renewable electricity producers. Chelan County PUD covers promotional costs separately. The SNAP program collected US$30,000 its first year, and rolled over US$9,000 to 2002. To reduce administrative costs, SNAP producers are paid once a year (on Earth Day). Jim White hopes that other counties and states have the foresight to establish programs similar to SNAP Think of what could happen if participating generators all across the country were paid up to US$1.50 per KWH from a voluntary fund. The SNAP plan might be a more effective incentive than ordinary net billing plans. "What happens in the future depends on customer participation," White said. 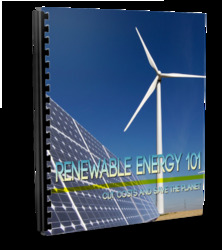 If customers are eager to support renewable energy, producers will be eager to generate it. That's what's unique about the program," he added. 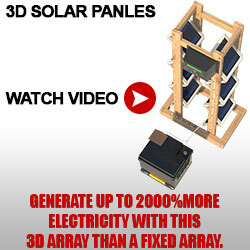 "It allows customer demand to set the supply. If enough PUD customers sign up to pay a little more on their bills each month, we can show the world that these renewable energy technologies are cost effective today, even here in Chelan County, where our electric rates are among the lowest in the nation." While the PUD is not funding local producers per se, the utility is lending its expertise to potential producers, and providing a means for consumers to support renewable energy. SNAP is a rate-neutral, pay-as-you-go system. It will not affect the electric rates of customers who do not want to participate. wire length. After final guy wire tensioning, ground rods were connected to each anchor rod, electrically grounding each guy wire. The turbine disconnect was wired, and it was time for commissioning tests. The turbine started spinning and there were smiles all around. Ceremonial tower climbing allowed for sweeping vistas of the high desert country, and we were proud of a job well done. Tensioning the guy wires and plumbing the tower. Climbing to unhook the crane. crane to make a straight-up lift without reaching too far out, which limits how much weight the crane can lift. The crane dragged the base until the whole assembly was vertical. As the crane lifted the tower closer to the tower base, we heard a loud snap. Hearts started pounding and eyes got big as we covered our heads. 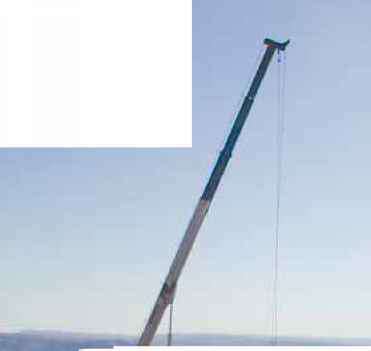 The crane strap was attached incorrectly such that one horizontal girt bore the entire weight of the tower and turbine when the tower became vertical. The girt couldn't hold it and broke, allowing the tower to be supported more evenly. The broken girt was later replaced. Just as the tower was close to vertical, there was a delay and we couldn't figure out why. One of the many onlookers (local television and newspaper crews as well as curious friends) saw that the top of the crane had become stuck in the tower. 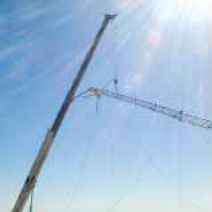 After a little finagling, the crane operator got it loose, but we later concluded that the crane's swing out boom, which had fewer things to snag on the tower, should have been used. The tower was placed on a pin in the concrete base and turned to line up with the wires coming up out of the trench. We secured the tower with cable clamps on the guy wires, and Randy became the first to climb the tower when he released the crane strap. The crane headed home, and we took a well-deserved lunch break, but we still had lots of work to do. How to make a furling wind turbine tail? How to make a furling tail design? How to make a furling system for wind generator? How to build a furling tail for a wind turbine? How to reduce the furling on a wind turbine? 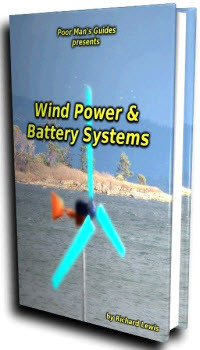 How to make a furling tail wind turbine you tube? How to build a furling tail for windmill? How to make a furling machine? How to wind turbine' tail furling metal work? How to make furling boom? How to make, wind generator' tail furling mecanismo and dimention? How spring furling system works windturbine? How to small wind turbine with tail furling?